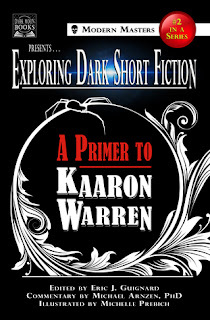 Exploring Dark Short Fiction #2: A Primer to Kaaron Warren edited by Eric J. Guignard in an introduction to the work of Kaaron Warren. Australian author Kaaron Warren is widely recognized as one of the leading writers today of speculative and dark short fiction. She’s published four novels, multiple novellas, and well over one hundred heart-rending tales of horror, science fiction, and beautiful fantasy, and is the first author ever to simultaneously win all three of Australia’s top speculative fiction writing awards (Ditmar, Shadows, and Aurealis awards for The Grief Hole). Dark Moon Books and editor Eric J. Guignard bring you this introduction to her work, the second in a series of primers exploring modern masters of literary dark short fiction. Herein is a chance to discover—or learn more of—the distinct voice of Kaaron Warren, as beautifully illustrated by artist Michelle Prebich. Enter this doorway to the vast and fantastic: Get to know Kaaron Warren. I'm starting my Women in Horror Month reviews with a highly recommended read. A Primer to Kaaron Warren contains six short stories by Kaaron Warren, an essay on "Why Karron Warren Matters" by Micheal Arnzen, an interview with Kaaron Warren, and essay by Kaaron Warren titled "Tips for Finalizing Your Short Story", and more. This was my first experience reading Kaaron Warren's work. I have a couple of her novels (one fantasy and one horror) on my shelves that I am really anxious to read. Her stories in this Primer were unlike any stories I've read before. I loved her voice, her imagination, and the feminist slant to her horror. Like the previous book in the Exploring Dark Fiction series (A Primer to Steve Rasnic Tem), Michael Arnzen provides literary analysis/commentary after each story. I love the setup of this series. They are also illustrated by Michelle Prebich. They truly are beautiful books inside and out. If you are looking for a woman horror writer to celebrate during Women in Horror Month (or after!!) or short fiction to read this month for the Ladies of Horror Fiction Readathon, I highly recommend A Primer to Kaaron Warren. The stories in this collection made my dark heart happy. Oh, sounds good! It's been a little while since I've read a good horror book. I love her stories so much. Yes! She is one to watch for! I do not know this author but the books sounds good. The whole thing was really great.